After nearly four years in the ranks, I recently found myself back in basic training. Not through any error on my part or a computer malfunction at Fleet Headquarters I should add. Late last year I passed my Admiralty Interview Board and was selected for re-training as an officer. Selection is highly competitive and it’s nothing short of an honour that my Unit put me forward for the board. On the other hand, after four years as a Rating, going back to drill practice and polishing boots is something of a culture shock. In this blog, I’ll be writing about what it’s like to go through basic training (for the second time) in the Royal Naval Reserve (RNR); as well as sharing a few anecdotes about my time on the lower deck. But as a place to start, it’s probably an idea to sketch out the ins and outs of joining the RNR; both as a Rating and as an Officer. Most Naval Reservists, regardless of education or civilian employment start out on the lower deck in a specific trade. After filling out an online application, candidates complete a series of verbal reasoning, maths, science and problem solving tests at a recruitment office; much like the tests Civil Servants do before submitting their job or Fast Stream applications. The standard is also pretty much the same. Pass the tests and it’s back for a half hour sifting interview with a Petty Officer or Chief Petty Officer: exploring your motivation for joining, your Naval knowledge and the role you’re taking on. There’s also a medical and 2.4km Pre-Joining Fitness Test at a local gym, after which you join your unit for training. The time taken to get through the process varies; but I’ve seen it done in a month or so. To join directly as an officer the early stages of the application process are much the same, but with an extra step: the Admiralty Interview Board, or AIB as it’s widely known. Again using a Civil Service comparison, the AIB is akin to the Fast Stream Assessment Day, but taken over three days and with tough physical tests. It starts with more psychometric tests: maths, problem solving and the fiendishly comprehensive Naval knowledge test. There’s also the planning exercise, an hour around a table solving a hypothetical crisis with your team: followed by a one minute presentation of your plan (without notes) and a long gruelling Q&A on the logical flaws in your plans (again, without notes). Then you do the practical assessment. You can find out more about that elsewhere, but to paint a picture: the bridge you will be building will be very wobbly, the water you’ll be falling into very cold, and the barrels you’ll be carrying very heavy. And after all that you still have to do an interview with a panel of serving officers; discussing your Naval knowledge (again), motivation and understanding of geo-politics. As an RNR rating – who had deployed operationally, had an in-depth knowledge of the Navy, studied international relations at university and a professional background as a Civil Service Policy Advisor in Government – I still found my interview incredibly challenging. The aim of the board is to see how you react under pressure, and be in no doubt, your assessors are masters at creating that pressure. I thoroughly enjoyed my time as an Able Seaman in the RNR and for people joining without any prior experience of the Navy or the sea, I feel it’s the best route into the Service. The training pipeline for a rating is six months (for an officer it is closer to two years) after which you get to experience the actual day-to-day life of a reservist. So here’s a tip for those who want to go down the officer route: RNR ratings also get a lot of training in Practical Leadership, Power of Command and Problem Solving; the very skills which you will need in abundance if you are to pass an AIB. I know quite a few who failed AIB first time, joined the service as a rating and then went back a few years later and passed their board with flying colours. Perseverance is a trait highly prized in the RNR and joining as a rating is an option you should keep in mind if you don’t get the result at AIB you were hoping for. And in the meantime, it’s one of the worst kept Navy secrets that the parties are often better on the lower deck! 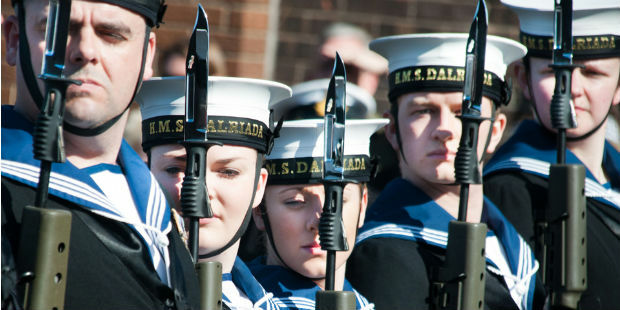 All the reserve forces (Royal Navy, Royal Marines, British Army and Royal Air Force) are actively recruiting: follow the links to find out what opportunities are available to you and how to join. It's nice top see lower deck leadership acknowledged, I've only ever heard that once before ,from a CPOMA who went MSO, who said that Dartmouth was like LRCC , only longer, with more cutlery, but basically that his Killick's training had put him in good stead. But he was a full timer, so I don't know if there's any difference. Anyway, that's very good advice . Quite frankly, outside specialist branches, I can't see why officer selection isn't always from the ranks these days, but there it is.